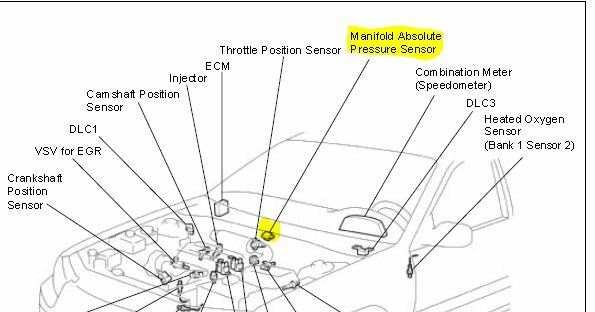 By a built–in sensor unit, the manifold absolute pressure sensor detects the intake manifold pressure as a voltage. The ECM then determines the basic injection duration and basic injection advance angle based on this voltage. Since the manifold absolute pressure sensor does not use the atmospheric pressure as a criterion, but senses the absolute pressure inside the intake manifold (the pressure in proportion to the present absolute vacuum 0), it is not influenced by fluctuations in the atmospheric pressure due to high altitude and other factors. This permits it to control the air–fuel ratio at the proper lever under all conditions. Help us improve AutoCodes.com. Leave a comment below or tell us if the information above help you fix the code. What are the symptoms on your vehicle for the P0106 1997 Toyota Camry code? Have you replaced any parts?